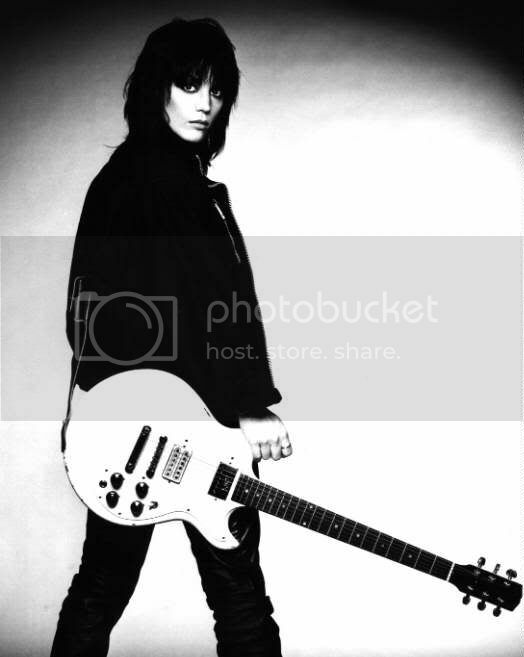 Thread: Joan Jett Melody Maker!!! I've been wanting this for a long time. It shows up as "coming soon" on the FQMS site, so no price. I can't imagine it being much more than say... $699 or so. IMO, the black pickguard/one pickup configuration is ideal. Re: Joan Jett Melody Maker!!! Anyone know what the issue could be? "In Heaven all the interesting people are missing." Here is a pic of Joans Melody Maker in the hands of its previous owner. Anyone here wanna guess who he is? That guitar has two humbuckers. Its got four knobs, and a switch in the front & jack. Joans has two knobs, one switch and one jack. I don't think its the same guitar. I'd guess that's Eric Carmen and that's what her guitar looked like when he owned it and how she played it for a while, at least. She's either had more work done on it or she has more than one. From what I've gathered, she's always used that one. I'm sure she has more than one. And I'm sure this one has been through more than one pickguard, and probably quite a few stickers. It is Eric Carmen from the Raspberries. And Joan bought his guitar years ago. Yeah I'm sure she's had some others made up. FINE! Poop on the fun trivia. Hehe. I'm not really a big guitar trivia nerd. I'll leave that to the Clapton and Peter Green fanatics. Hell, I'm not really even a *huge* Joan Jett fan. I mean, I like her and all. That just happens to be one of my favorite guitars that a pro is "known for". 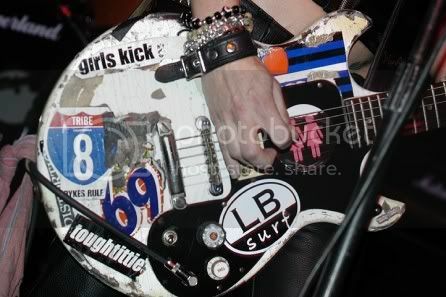 I'm not a huge Joan Jett fan, but I gotta admit this guitar looks real cool. Maybe it's been pulled because Jett did'nt give her full consent or some such thing. I hope not because it'd be a fun axe to have. I'm not either. I loved her version of Gary Glitters "Do You Wanna Touch". But "I Love R&R" is fast becoming like "Midnight Hour", "Mustang Sally" or just about anything by Van Morrison. I want an extra $50.00 per song, or a 3 tune package for a buck and a quarter. Eric Carmen in the Raspberries though was quite rockin! The Fonz's girlfriend was Pinkie Tusqadero, Suzie Quatro was Pinkie's little sister, Leather Tusqadero. Got it "Bucko"? Man, it's kind of sad that I know this, but "Sit on it" woa! I always thought it was a bit strange that Leather sang Devil Gate Drive - in the 50s. "Why are we going to an airforce base?" ...But "I Love R&R" is fast becoming like "Midnight Hour", "Mustang Sally" or just about anything by Van Morrison. I want an extra $50.00 per song, or a 3 tune package for a buck and a quarter. Mustang Sally must be the most stepped on cover ever! You like Joan's version of the Do You Wanna Touch song - how about the video? Longevity is the key to success. "two knobs on top and a toggle switch in the middle down low:"
It's not like anyone was blindsided that she (or any of the Runaways) were dykes, but she sure grew up to be a bow wow! And now she rubs rugs with Carmen Electra! Go figure! "A little bit of knowledge can be a very dangerous thing." It's well known that signature guys have inquiring minds. Wow. This thread got weird. I guess I'm going to email Gibson to see what's going on with this guitar. The question remains whether this guitar will become a reality or not. My opinion is worth what you paid for it. Wasn't this thread about the guitar? Due to the overwhelming interest in who Joan Jett is bumpin' uglies with, I finally emailed Gibson to see if this guitar was still being released. I almost typed "to see if this guitar is still coming out", but I didn't want to fuel the gay joke fire. Yeah, I really live it up on the weekends. Hangin' out, emailing Gibson and all. Party. my turn to jump in..
in 1994, as i was late headin' into work one day, i figured : why not? i'll stop into my small, local music store and... BAM! i saw a nice 'old' MM hanging on the wall. i dug it's vibe, it's dbl cutaway shape so i ended up buying it on the spot! nashville TOM + stop tailpiece. THE NECK IS HUGE, meaty, great for bending them strings, but oh-so-comfy! the whole guit resonates wonderfully, is light as a feather and though i have a bunch of 'collectable' and expensive guits, this MM has become my 'go to' gig guitar.it's ALWAYS come through soundwise, holds it's tuning, and LOOKS COOL to boot. i'd buy another one like it if i could. Yea but does it have stickers? no stickers, not into this whole JJ issue, my point is that at that time, i didn't own any SG's or any 1959 dbl cut JRs or SPECIALS, so when i say that beautiful CHERRY mahogany MM hanging in that local shop, it filled a 'niche' that i was jonesing for at the time VISUALLY, and only AFTER the purchase, did i actually learn how great it was to PLAY on! the ONLY downside to it is that it is 'neck heavy' and not balanced when i let go of the neck. it truly is a great PLAYER guitar. best part is, that i paid either $195 [could've been $295, don't really remember which] for it! i'm holding it in my avatar pic. OK, is this guitar going to be made or not? Still not listed on the Gibson GOW page. Just goes to show that the most expensive guitars are not always the best ones. "No information on this model at this time. Monitor www.gibson.com for updates." the 'best' guitars, are the ones you feel a 'connection' with. if holding the guitar makes you look cool and makes you feel cool and 'inspired', and ..of course, if the guitar SOUNDS cool, then THAT is the 'best' guitar. i won't bore anyone with listing my 'collection', but my trusty old MM always 'comes through' for me..